Available in 2 Models - 5-40ul; 40-200ul. Eight Channels - Ideal for filling elisa plate and microtitre plate. Precision and efficiency are ensured by equal volume dispensing through all the eight channels at a time. Highest level of accuracy and precision. We offer highly reliable Non autoclavable and Autoclave Multi Channel Pipettes. We offer 8 channel as well as 12 channel pipettes. Our pipettes meets your high quality demands by providing exceptionally accurate pipetting while standing up to the rigorous of everyday use. 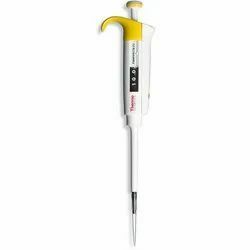 THERMO Electronic 8 channel Variable Volume Pipette, capacity 30 to 300ul. Pre-owned. - Soft force tip loading and ejection. 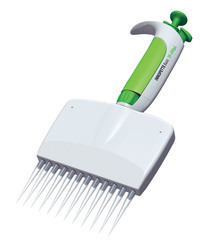 Introducing the new thermo scienntific finnepipette F2, a pipette that has all the right qualities. It offers superior comfort, performance, reliabilty and repeatability in one of the lightest poettes available. One can avail from us a quality approved assortment of Multichannel Pipette. Owing to their top quality, our products are extremely praised amongst the patrons.